Want to learn more about someone? Try to teach them something. My girlfriend Sandi was telling me about a baby shower she was going to host. The color scheme was going to be pink, brown, and white. Fun! She tells me all about her ideas for decorating the venue. And, since I'm always looking for an excuse to try new cookie designs, I thought this was a great opportunity, so I offered to bake some cookies. We were discussing this on a Wednesday, or so, and the shower was the coming Sunday so I told her I couldn't make any promises, but I would try to get them made by Saturday evening. But Sandi had a better idea. "How about if I come over and help you?" Uhm..."OK. Yeah. That could be fun. Maybe you could help me." Now I'm an easy-going, patient person, but there are some things that I am particular about. The words "bossy" and "control freak" have been used lightheartedly by friends and coworkers. And I'll admit that I have my quirks. But, I know that whenever Sandi and I get together, we always have fun. The cookies were just for practice and no one was actually paying me for them, so I figured, what the heck? Let's do it. We agreed to get together Saturday since her son and my daughters had been invited to sleepovers, so we would be kid-free for the evening. Sandy arrived at my house at 5:30 Saturday afternoon, with enthusiasm and excitement, ready to take on the world of cookie decorating. Long story short. I am a very patient person. Sandi is not. I have rules when it comes to some things. Sandi does not. But we pressed on. We agreed that I would outline and Sandi would flood. And she did pretty well for it being her first time. Once the flood icing had crusted, we began to apply the detail outlines to the cookies, which brought them to life. By the end of the evening, make that 3:00 Sunday morning, Sandi made it very clear that I was a much more patient person than she was. I, in turn, made it clear to Sandi that if the day ever came that I was baking and decorating cookies for a living, we probably wouldn't be working side by side. We had a good laugh. In the end, the cookies were very cute. Well, most of them were. If you didn't look at them up close. On a serious note, we did have fun. Sandi learned something new and I got to spend an evening with a dear friend. Something that doesn't happen often because while we are not only friends, but coworkers, we don't spend much time together at work or otherwise. I think the next time we get together it will be to sit on the patio and drink adult beverages while my husband does the cooking! 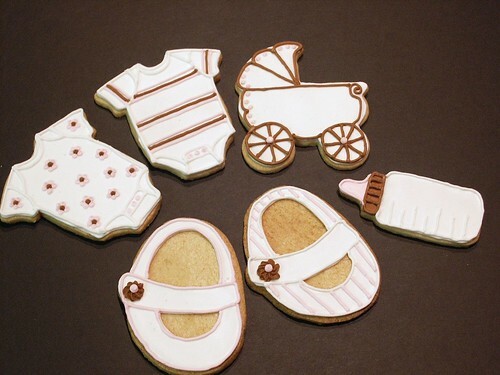 Cookie Notes: I own cutters for the onesies, baby buggy, and baby bottle. The shoes were inspired by Susan Caliendo's shoe cookies found on her website, Rolling Pin Productions. They were handcut from a template drawn on cardstock. The striped onesie is also inspired by one of Susan's designs. My sugar cookies were baked using the cookie dough recipe found on page 120 of The Flour Pot Cookie Book by Margie and Abbey Greenberg. Not only does it perform well, but it tastes great, too, which is very important to me. I use royal icing to decorate my cookies and the recipe I prefer is known on Cake Central as Antonia74 Royal Icing. You can visit her website, Marmalade Cake Company.